During a sit-in protest of residents, mainly wome, of Lefkimmi blocking the entrance of trucks at the disposal dump (XYTA) the government is cunstructing in their area illegaly and despite their stated dissaproval, the police attacked to arrest persons of their selection from the gathered ones, using tear gass to intimidate the people. However, the gathered residents resisted and fought back the riot-police brigades. During the clashes, a group of residents succeeded in isolating a police van, and after they took away their shields, uniforms (and underpants), they let them run away naked, humiliating them in this way, while they burnt down the police van! The cops though did manage to arrest one persons, and a 150 strong solidarity gathering took place immediately outside the police station, in order to pressure the cops to liberate him. 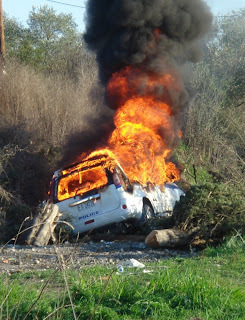 Police terrorism and threats against the residents resisting XYTA dump construction is in an every day level. So are also the residents mobilizations. Older reports about residents action on this blog, can be found here.